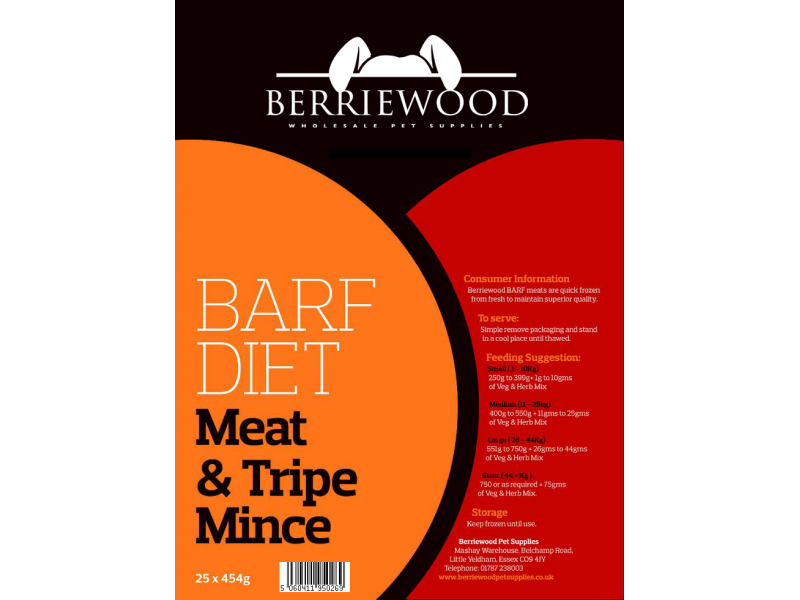 The BARF diet (Biologically Appropriate Raw Food) is a diet consisting of only uncooked meats, bone, legumes, fruits and vegetables. 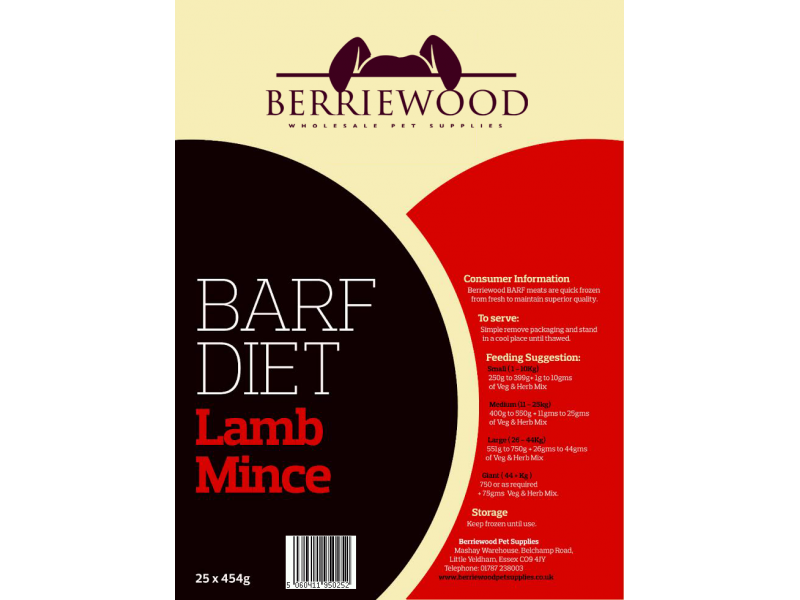 Dogs, like humans are omnivores, not just meat eaters and like us they require a balanced diet. 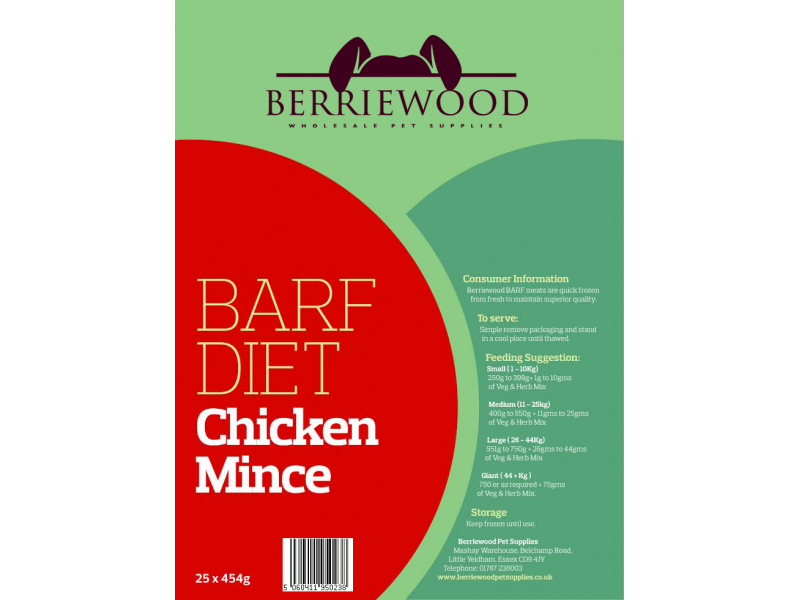 The BARF diet is designed to mimic the evolutionary natural diet of the dog. Initially, like his ancestor the wolf, he was a hunter. Therefore, the ideal food for our dog is the same as the food of its cousins in the wild, i.e. the total prey. The wolf not only eats the muscles and organs, but also the contents of stomach and intestines. The stomach of the prey is filled with pre-digested grains, vegetables and fruit. 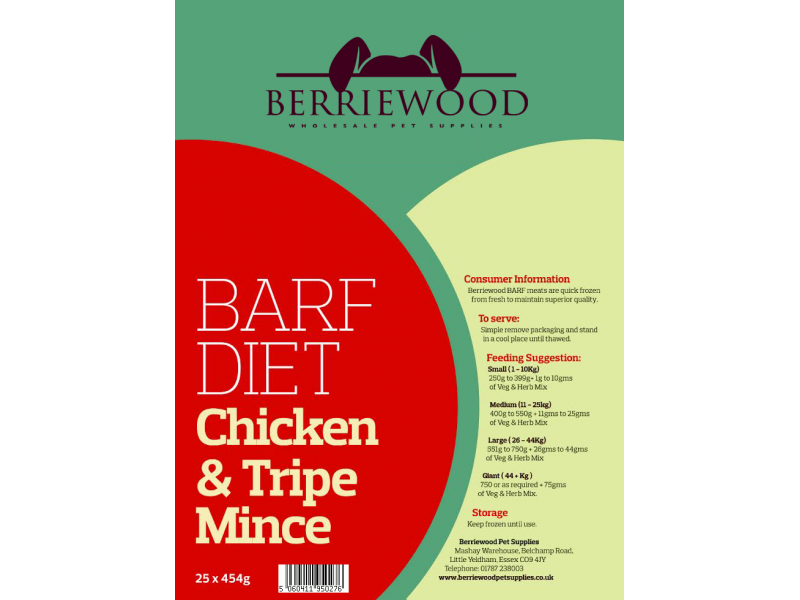 The BARF diet is suitable for all breeds from puppies to old dogs, even working dogs. Many commercial foods offer different types of food for age, breed and activity level. In nature the wolf does not have a choice of high protein meats or low fat meats, it is simply the quantity eaten that alters. Until they are 4 months old pups in the wild have priority when feeding. They can eat first, simply because they need more food. An old dog, a dog that is not very active or an overweight dog does not need different food, simply less food. 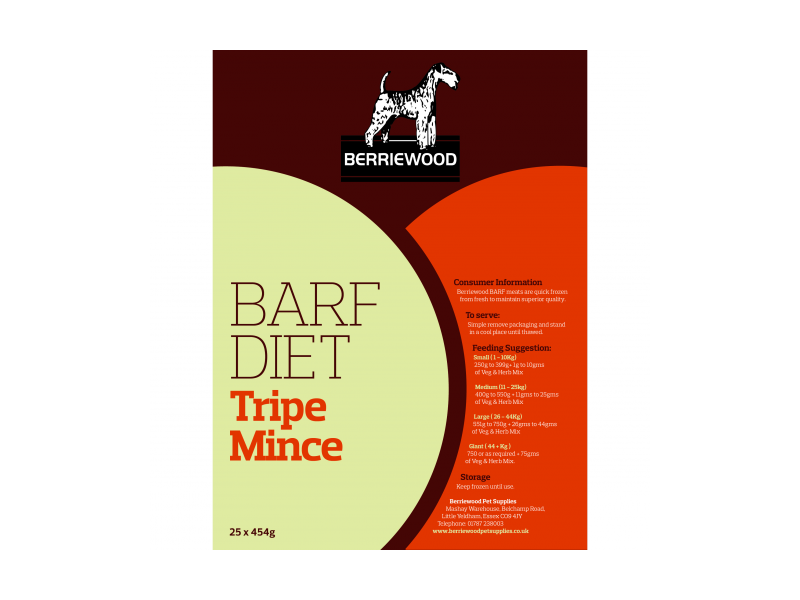 When feeding the BARF diet we advise you to give your dog a natural snack or bone immediately after his meal. This extends the time the dog is busy with food in a natural way. When chewing a natural snack after its meal, it develops enzymes which digest his meal better. Don't be afraid of your dog choking on chicken bones as raw bones are soft and your dog will chew and swallow them. The calcium in the bones is also very healthy for them. You should however keep an eye on your dog when he is eating a bone, especially if this is his first time. Once he is used to getting meat and bone on a regular basis, he will slow down and take his time. 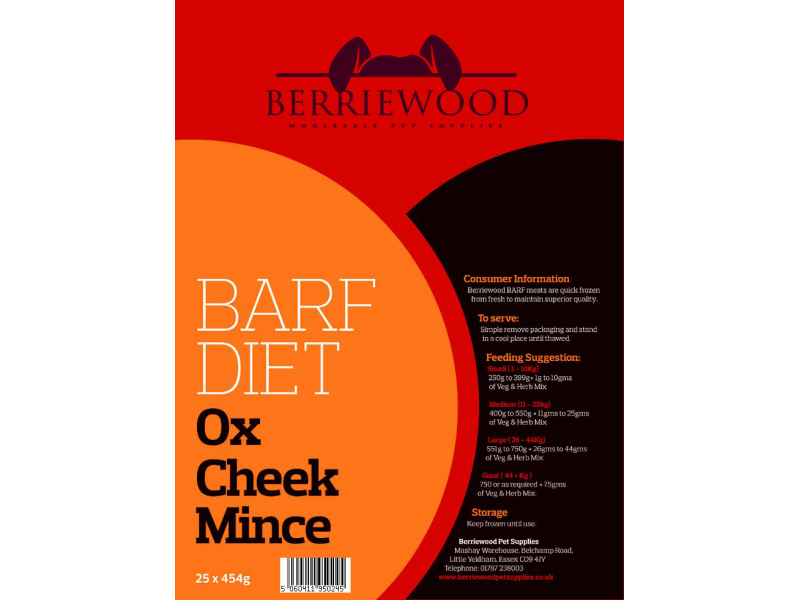 Below are some recent questions we've received regarding Berriewood BARF Breeder Packs, including answers from our team.